Ty Paer near New Quay sleeping 2 to 4 . Ty Paer is part of Cefyngwyddil - a grade II listed farm of 200 acres, close to the coast at New Quay, dates back to the 16th Century and has been farmed by members of the present family for many generations. The buildings retain the look of the original farm and are grouped around a large courtyard including store sheds, and animal enclosures. Ty Paer sleeps 2 plus a baby in one double bedroom with a sofa bed in the sitting room for an additional 2 adults. The large bedroom has a high vaulted ceiling, with a black and brass metal framed double bedstead and pine bedroom furniture. There is ample room for a travel cot, which can be provided if required, together with high chair, baby bath and bouncer. Regret we cannot accept toddlers or children above one year of age. The bathroom which has a sloping ceiling and roof light, is fully tiled, and features a free standing slipper bath - wonderful to relax in after a day's activity! The cosily furnished sitting room has a large chimney with a traditional canopy which extends right up into the bedroom above, a rare feature of older Cardiganshire homes . There is a top quality sofa bed in the sitting room to extend the sleeping accommodation. Two steps take you down to the extra large, luxury kitchen, with its solid oak units, beech worktops and 'Belfast' sink. The kitchen is fully integrated with an electric oven and ceramic hob, microwave, washing machine, dishwasher and fridge with freezer compartment. A large table and four chairs complete the kitchen. The farm is primarily a sheep holding but also has a small herd of beef cattle. As this is a working farm visitors could have the opportunity of observing some of the activities which take place on a Welsh farm, according to the season. The side and rear of "Ty-Paer" is lawned and has a patio complete with garden furniture. It is fenced all around, and offers peace and privacy. The only company you will have are the sheep who usually graze in the field at the end of the garden, and of course the birds. During the Summer months we have literally dozens of swallows and house martins flying around the yard at the front, and Red Kites which were very rare not long ago, are also now frequently to be seen cruising overhead. The farm is less than 1/2 a mile away from the village of Cross Inn which conveniently has two shops, a pub/restaurant and a post office. 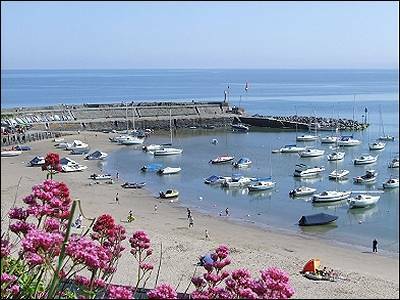 New Quay is just 2 miles away. Pet: One mature dog welcome at additional charge of £20 per week. Short breaks are calculated as follows:- 3 nights =65% of weekly rate, 4 nights = 75%, 5 nights = 85%, 6 nights = full weekly charge. Nearby Aberaeron is a charming regency town and with its multi coloured houses and attractive harbour. Twenty miles to the north of New Quay is Aberystwyth with its university, the Welsh National Library, an excellent free museum and a wide range of shops. Here also you can take a trip on the picturesque Rheidol Valley steam railway to Devils Bridge in the nearby mountains. 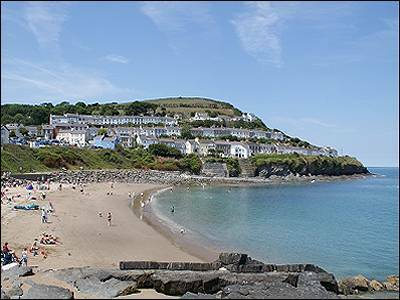 18 miles to the south of New Quay is Cardigan with its castle on the river Teifi and nearby St Dogmaels with its historic abbey and Poppit Sands. Just across the Teifi is the Welsh Wildlife Centre and a few miles up the river is Cilgerran with its spectacular castle.